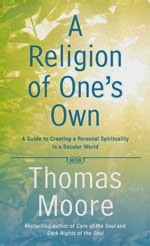 Mary Jablonski of Charlottesville, Virginia reviews Thomas Moore's new book A Religion of One's Own for Blue River Monthly. She writes, "Moore talks in detail in the book about how he practices his own personal religion, and that helps the reader gain a sense of what it means to approach spirituality in this way. Among other things, working with dreams has been a significant practice for him. He writes that dreams 'are an open window allowing fresh information to enter from elsewhere.' He also gives examples of people who he believes created their own religions — they include the painter Georgia O’Keeffe and the naturalist and writer Henry David Thoreau."